Argan Virgin Organic Carrier Oil is an oil produced from the kernels of the endemic Argan tree, that is valued for its nutritive, cosmetic and numerous medicinal properties. Grown in North Africa and mainly in Morocco, the Argan tree grows wild in semi-desert soil, and is extremely well adapted to drought. Argan Oil is considered to be one of the rarest oils in the world due the small and very specific growing area. Color: Pale yellow to golden yellow liquid Aromatic Description: Argan Carrier Oil has a nutty, spicy and oily scent. 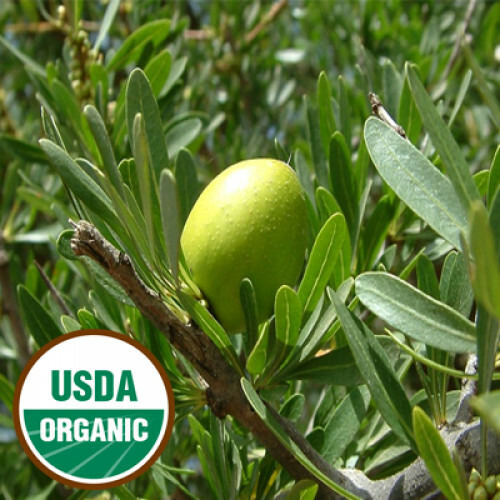 Common Uses: Argan Carrier Oil is used in manufacturing soaps, creams and shampoos. It is rich in vitamin E, carotenes, antioxidants and essential fatty acids, is used for massage, facials and as an ingredient in anti-aging cream and even aftershave lotion for men. Argan Oil can also be used to nourish the hair making it shiny and healthy looking. Consistency: Typical and Characteristic of Carrier Oils. Absorption: Absorbs into skin at average speed, slight oil feeling left on skin.